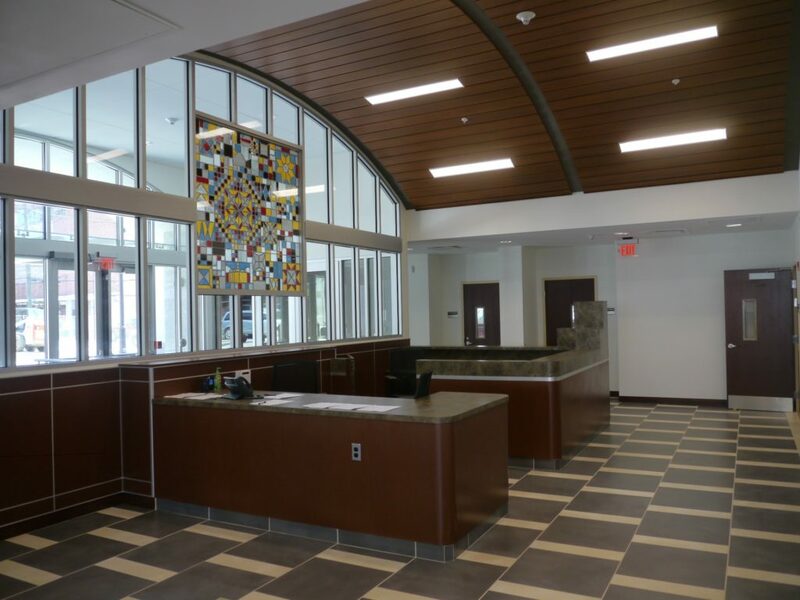 The West Virginia State Office Building reception area houses the stained glass dedicated to the culture and history of West Virginia and specifically Logan County. Elements include historical symbols to honor the prehistory era of the Native Americans, early settlers, government sites, miners and state culture. The concept was to fabricate the window in the form of a historic “crazy” quilt and using as much glass from West Virginia Manufacturers as possible. The quilt used as the model was sewn from wool by Elizabeth Kobler circa 1778, Harpers Ferry, WV. West Virginia Mountains: seen on the mid to lower left, mountains forever. Double Spearhead: Representative of the cultures of this area pre-history, upper right. Double Mountains: Native American representation, center left. West Virginia Quilt Star: Focal point of the window, offset center. Original Logan County Courthouse: Now gone from the landscape, lower left side. Coal Tipple: Throughout the county and state, upper center. The artist researched the history of the town and worked with the interior designer to choose colors that worked with the interiors and were available from glass manufacturers. The window was one of the largest the artist has ever built and required her to add additional reinforcement to the design. The window was assembled in smaller pieces and then placed together on a table specially built for the project. The window framing was modified to accept the artwork and to cover the piece with protective glazing. The stained glass window was installed on February 13, 2013.